Cookie Monster is all wound up. The Count has him hold up his furry blue fingers, count them (of course), and blow on each one in turn as if he were blowing out a birthday candle. Afterward, Cookie declares, in his familiar growly voice, that he feels much better. "Hey! Me feel terrific! Me calm. Me relaxed." You won't be catching this scene on HBO or PBS. 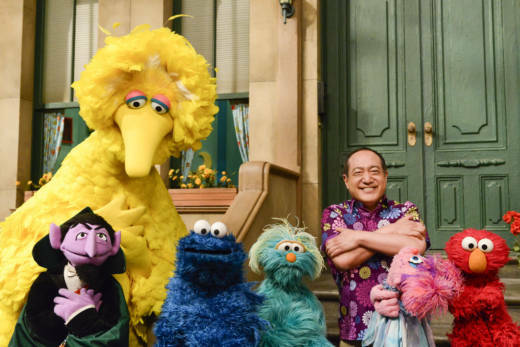 It's part of a special initiative called Sesame Street in Communities. Free materials, including videos, books and games, will be released today to help parents and caregivers, in turn, help young children cope with traumatic experiences. The science of adverse childhood experiences, or ACEs for short, is beginning to transform education and social services. ACEs include poverty, abuse and neglect, domestic violence, divorce, and mental illness or substance abuse on the part of a caregiver. A new analysis of the 2016 National Survey of Children's Health, released today, shows that nearly half of American children experience at least one of these adversities, and 1 in 5 have had at least two. Research shows that growing up with more ACEs negatively affects children's development, education, and even later in life, chronic disease and longevity. But children's brains are also resilient, and they can recover with the right kind of responsive care. Sesame is better known for teaching preschoolers letters and numbers. But those familiar furry characters are also taking on tougher topics, says Jeanette Betancourt of Sesame Workshop. In the past two years, Sesame in Communities has addressed the incarceration of a parent and bereavement, partnering with local organizations to share directly with families affected. The new trauma material focuses on simple coping skills for what many in the field call "big feelings" — like anger, anxiety and sadness. The goal, says Betancourt, "is to provide positive ways to connect children and the adults around them regardless of what the situation is." In one short video, Big Bird imagines himself in his comfy, cozy nest. In another, Rosita, a green monster Muppet, punches a pillow to let out her anger. Sesame's human characters, Alan and Sophia, play the roles of nurturing, encouraging adults. Sophia tells Rosita, "It's OK to let your feelings out. There are safe ways to let your feelings out." "Really hard starts in life"
Ann Thomas is CEO of The Children's Place in Kansas City. It's a full-day therapeutic program for children who, on average, have experienced five traumatic events before the age of 6. "They've had some really hard starts in life," she says. "That does impact their development." Thomas consulted on the new material, even visiting the set when the Muppets were filming. She applauds the focus on skills to manage emotion, rather than having Muppets delve into what caused the emotions. This mirrors the course of treatment for children moving beyond trauma. "Teaching these coping skills first, creating a sense of safety, consistency and predictability — that is the No. 1 step," she says. "It doesn't matter if it was sexual abuse or a house fire. You're scared, you're not trusting, you're not sleeping." Though the videos speak directly to children, Thomas thinks they can also help adults. "I think one of the biggest values of this material is as a bridge for adults to take grownup issues and put them in developmentally appropriate words to help children heal," she says. This is a skill that even the most well-intentioned grandparent, teacher or foster parent may not have. "When it's your child, you don't want them to hurt," she says. "Sometimes we want to say, 'get over it.' It's hard to be with a child in that pain." She notes that it can be comforting in itself for children to see familiar characters dealing with these emotions. Traumatic experiences are sadly common, but not much talked about in most kids' media. "When it's done by Sesame it gives it credibility," she says. "If Sesame is doing it you're not alone." Therapists at her organization, The Children's Place, will share the videos with families in the hope that caregivers will follow the lead of characters like the Count, find the words to reassure children feeling big feelings, and teach them how to create their own safe places.